The safari jeeps arrived in the late afternoon. 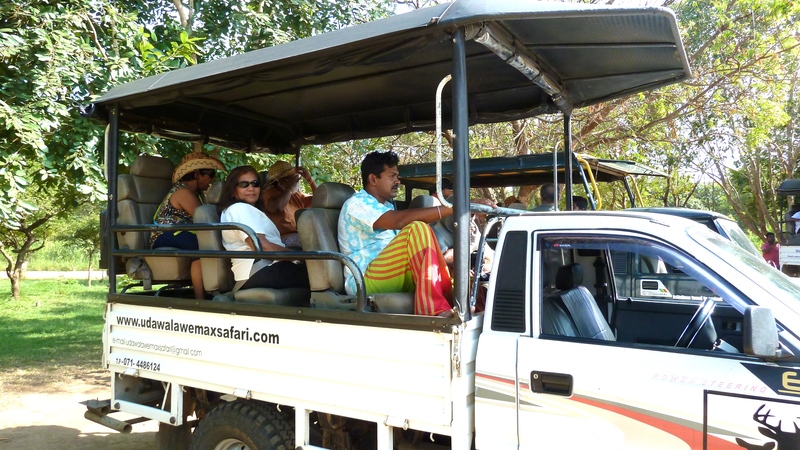 We had travelled from Colombo that morning to the Udawalawe Safari Village Hotel, visiting the Elephant Transit Home en route and were looking forward to the game drive. Udawalawe National Park was established as the fifth national park of Sri Lanka in 1972. The total area of the Park is almost 31,000 hectares and this makes the park one of the most expansive in the island. The most common type of environment here is dry grass and scrubland and the park is home to one of the highest densities of elephants anywhere in Asia. They are smaller in stature but more aggressive than the forest elephants of Sri Lanka. I was hoping to have close encounters with the park’s elephants. I did not have to wait long. We came across lone males and herds with babies, all too busy feeding to bother with us. Some came so close we could reach out and touch them – almost! (see video clip below). We watched a jackal eyeing a herd of deer hungrily. Buffalo wallowed in mud pools and a brown mongoose scurried along the track and disappeared in to the bush. Crocodiles basked in the afternoon sun. Birding that afternoon was excellent. 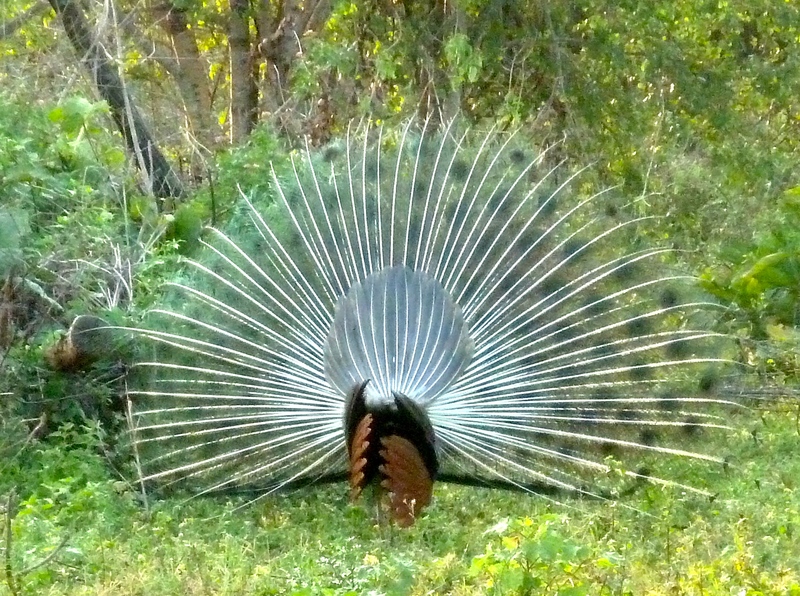 There were Bee-eaters, Forest Wagtails, Plovers, Sandpipers, Yellow-wattled Lapwings and Malabar Pied Hornbills. Once a Blue-faced Malkoha flew across the track in front of the jeep. We had cakes & ginger beer on a gigantic rock formation overlooking the Udawalawe Reservoir before driving back to the hotel. There were fishermen in their little dugout canoes casting nets as the setting sun coloured the water pink. 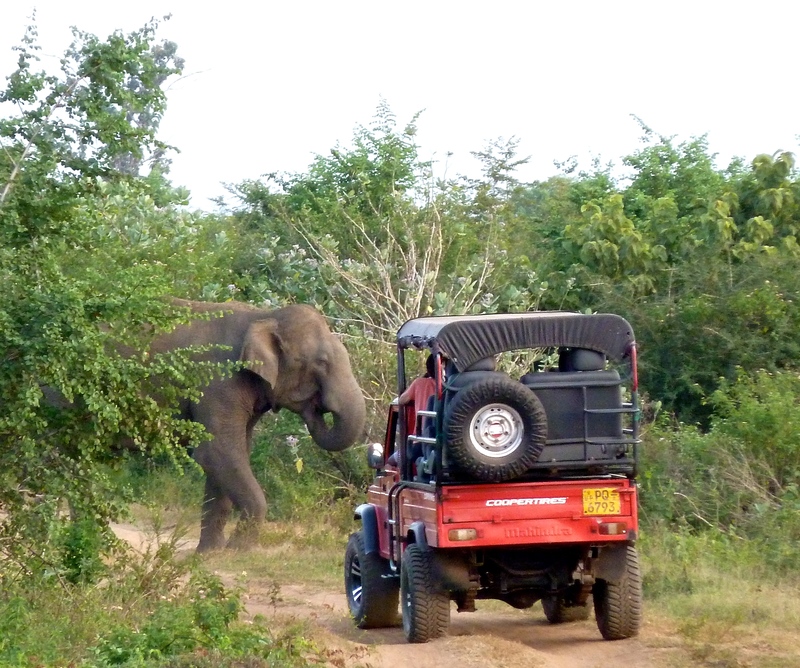 It was the most rewarding game drives I have ever had at Udawalawe. Reblogged this on Bandi's Blog. A beautiful place. You have caught so much with your camera. I think anyone in England at the moment would wish to swap places with you at this time!